The greater a bodies' velocity the more it can resist collapse through time, states this new theory of Cyclical Time Progression. So, what happens when we stop moving altogether?" Cyclical Model for Time explained. In the last few chapters we explored the concept of cyclical flow and the dimension of time as being a fractal progression. This gave us a perceived notion of movement through time, a passage of which we can be consciously aware. Even though we can't see the past or future, they must exist. Whereas, before, there seemed no difference between a person now and that same person five minutes ago, now there is a difference; we scale as we journey through the cosmos. Our proportions change over time. We visualised our existence in the fictitious Nth Dimension, and determined that our cyclical progression through time must either be a universal collapse of all matter, or alternatively an expansion. 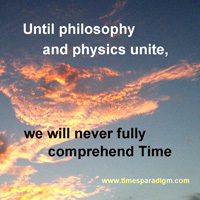 It must be reiterated here that this paper, Time's Paradigm, is not a physics discourse; there are no formulas to mull. Time is a subject involving many different disciplines, as have been covered in previous chapters. It is the purpose of this paper to discuss concepts of time and space and merge these disciplines. Physics is only one area of interest, it is not the authoritive voice of time, though what it has to say about time is provocative and must be integrated. The processes of reasoning, deduction and experimentation are equally compelling, and together will, in due course, help better our understanding of time. Here, we tackle some physics, but from a philosophical point of view. Expansion requires that energy be constantly added, or that space is constantly getting larger, one could assume. We might also assume that continued expansion evokes the notion of infinite resolution and, for some objects in the future, perhaps even a loss of identity. What about if we expand for a bit and then collapse? That gives us the bizarre prospect of living our lives one way and then heading back in reverse. Or, vice-versa! But that would not be the circuit we had been looking for in previous chapters: the cyclical passage of time deemed necessary for there to be flow. Such a notion would be like a time line that expanded and then contracted, indicating a slowing down at the ends, a stop, and then a reverse. We might consider that our existence exploded into being like a giant firework. This explosion would have been at the speed of light (c), where time apparently stands still. So, in essence, it either happened instantly, or never really happened at all, it just was. Hardly a satisfactory conclusion, but let's wait and see. The Big Bang has elements of this. A cosmos that came into being from some immense ejection or emergence of matter at (c). Perhaps so. But we still need to understand from where, in order to follow the conjecture that this fourth dimension is cyclical. It must also be noted that at the moment of the Big Bang Singularity, we are assuming that there is nothing, until there is something. Alternatively, as we will consider later, matter may be emerging continuously in time, and not all at the same time, thus alleviating this problem. Our existence - our Universe - is a contained entity. It has always existed. The need to suggest a beginning, so we can get to grips with this extraordinary sphere, is necessary, and helpful in visualising, but once we have 'got it', we can dispense with this idea altogether. In this regard, it is likely that existence of matter has always been pouring into the Universe, there was no one Big Bang, it is a continuous affair. Time's Paradigm does not present this as a postulate, rather it offers it for consideration. Our Universe is the presentation of all time, the past and the future, not just an illusory present moment. The Universe itself is neither expanding nor contracting in this scenario, it has finite energy; it is perpetual. It is the contents of the Universe which could be said to be evolving. Since the inception of Relativity, many scientists have had a problem with an expanding or contracting universe, including Albert Einstein who was hoping for something more constant. If space were empty and infinite then, yes.., we could go on expanding forever after emergence. But, we have already dismissed space. Instead we have explained that all things are connected, even space is involved - but only the space in our universe, there is nothing outside. Progress dictates as much. For there to be a continuous cycle of time, we are either in expansion or collapse. Expansion seems unlikely, so let's consider contraction. Contraction, as conceptulaised here, is akin to entropy. Not a reduction of energy but a change in purpose. A re-arrangement of priorities in atomic functionality; a return to some smaller, less complex existence where everything first emerged. That 'singular state', perhaps. Contraction denotes a physical difference between one moment and the next. As we get smaller, therefore, it is natural to suggest we are witness to progress in time. The smaller we are the faster our clock ticks. It is indeed the case that smaller things progress or function at increased rates; the shorter a pendulum, the faster it swings to and fro. Most insects, for example, have very high metabolisms, they move with immense speed and their life span can be numbered in days, relative to our larger size. And as we delve deeper into inner space, we find particles of matter with relativistic speeds and life spans of less than a second. The Universe as presented here would be a tight squeeze. Matter constantly emerging at light speed, pressurizing the closed system, acting on all things; just as the pressure on objects submerged in water. Space would act equally from all sides on objects and they would be forced to contract. Gravity is such a universal force; in essence, both macro and subatomic orbits would be reducing, spiralling inwards under such pressure. This universal contraction would not be so easily measured by us sitting at the coffee table. Unfortunately for us, all things would be contracting simultaneously (for the sake of simplicity, we are just considering our planet, for now). Our measuring devices would all be shrinking, and the distance between everything, too, and all relatively speaking at the same time. So nothing would appear to be in collapse. Nor should it be implied that we suddenly find ourselves with less atoms in our body. We could describe this process as saying, smaller atomic levels with less space between them. Not forgetting that size is relative, an atom is distinguished by the 'text book' circular path of its associated electrons. Under the influence of contraction we could describe this path as a spiral, descending ever inwards; therefore, no difference in size between moments could be measured; an undetectable and unbroken passage through this dimension of time - a continuous flow. Note: contraction is in time, the past remains large, the Universe still appears to an outsider to be the same giant ball of energy, but those aware inside are actually shrinking towards their future. Scientists today are in agreement that the universe is expanding. So it might appear, in three dimensions of physical existence, for sure. But, what about in four dimensions, where the fourth is a contracting progression into the future? It takes time for light to get to our telescopes, so we are really looking into the past as we peer into the cosmos, when the past universe was much bigger. Light leaving a distant, contracting galaxy will have its frequency lengthened, or red shifted (the Doppler effect), just as if it were receding from us. As with all measurements, the equipment we use must take into consideration all parameters, or the conclusion will be flawed. This has been a recurring theme, beginning a millennium or so ago, with the revelation that we were not living on a flat world but that it was round, sort of 'three dimensional'. Today, we know that there is a shorter way to get from London to New York in a plane. It does not seem like a direct line if we look at a two dimensional map, but the curvature of the Earth does the magic, and we arrive - on a geodesic. Cosmologists have recently been coming to grips with the possibility that our universe is actually accelerating in its expansion, and they have a need to explain this by resurrecting a Cosmological Constant, which they now refer to as Dark or Phantom energy. They need something to express this extra, invisible energy. Universal Contraction (UC) the core postulate of this paper, Time's Paradigm, has an alternative explanation, as we will soon find out. Everything shrinking? Surely too ludicrous an idea to have any bases in scientific fact! Well, it's not as outrageous as you might think. At the turn of the 20th Century, working on similar problems as Einstein, two scientists independently (Fitzgerald and Lorentz) came up with a theory of contraction in explaining objects travelling through space. They tried to suggest that the failed Michaelson-Morley Aether experiments might be attributed to a discrepancy in the actual size of the measuring devices used as they changed through time. Einstein, a few years later, came up with his own, elegant theory, and Lorentz contraction was incorporated. Contraction, therefore, is not off limits and may be quite relevant. UC is intrinsically a re-evaluation of SR and equally conveys that there is a change in our mass dependent on our speed through the Universe. SR says in simple terms that energy equals mass; so the faster we go (more energy) the more massive we become (relativisticly) and the slower time flies (time dilation). To accelerate we need to pump more energy, rocket fuel, whatever, into our spaceship, so its mass will increase; until eventually we will need so much energy as we approach the speed of light that its mass would become infinite. Alternatively you could explain it this way: that an object gets harder and harder to push against its inertial mass, the faster it goes. SR asks us to accept that while the speed of light remains constant for all inertial frames of reference, e.g all observers, the rest of the things we hold to be constants, like distances, mass and time, do in fact fluctuate for no perceptual reason. This poses a problem for those wishing to conceptualise motion and speed and how our World works. By considering that there is a tangible reason for changes in mass and rates of time, rather than just being told it has to be so in order for the speed of light to remain constant, we can grasp the reality of such an extraordinary set of circumstances. UC proposes this: the faster we go the slower we contract; so it appears to someone watching us go by that we are gaining mass in relation to them; it also means our on board clock is ticking slower in their view, because contraction is our clock speed. In essence it is saying the same thing as SR, using the same formulas, except from the opposite side of the mirror. As an example, we have a vehicle of physical dimension being squeezed by the Universe. We add energy to make the vehicle accelerate in a particular direction. Now it has more energy with which to counter contraction; the vehicle shrinks slower. To outside observers on, say, Earth and travelling slower, this vehicle for visual purposes would appear to be increasing in size, when actually it is the observer and his surroundings that are shrinking at the reference rate back on Earth, which is more quickly than our speeding space vehicle. No one is actually getting bigger or gaining in mass, it simply appears so. Observations from the speeding vehicle would conclude that its surroundings were shrinking, in line with Special Relativity, by an amount equivalent to the Lorentz factor. UC does not disagree with SR, it merely gives us an ability to visualize those inconsistencies of time, mass and distance. UC says they are real, and not just required variances so that (c) remains constant. We can look at it like this: energy is shared between the physical dimensions and the dimension of time, and transfered between them as necessary. As forward motion in one direction is increased (acceleration), a reduction in the rate of time (or contraction) is experienced. Clocks speed up if we decelerate, our metabolism increases, because particle functionality gains energy from reduced forward motion; less interference from physical motion in the macro World means atomic particles have greater mobility. This internal energy transformation is not entropic. The second law of Thermodynamics does not apply. The motion of atomic particles clearly includes forward motion, their paths being altered, elongated or twisted; they will be completely restricted at light speed, whereas at slower speeds particles will spin and interact more freely. When a body's forward motion practically ceases, particle functionality becomes supreme, and atomic perfection is reached. An analogy would be this: a spinning gyroscope, when influenced to rotate on its axis, responds by rotating through another. Energy was transferred from one to the other, the gyroscope did it, by itself. What of these extremes? UC is suggesting that at some time way, way in the past, we must have been very, very massive and so probably entered our existence and our journey through time, clocks frozen, at the speed of light. That said, we are therefore heading towards a future where we will eventually become very, very tiny and practically immobile, but our time would be passing unimaginably fast - all over at once ..; in other words, we will be contracting at the speed of light. Time and velocity, one great cosmological cycle! As we decrease in velocity, our rate of flow in time increases. And, as cyclical progression only occurs in one direction, the conclusion is: we are forever decelerating, from the speed of light to zero velocity; our clocks forever ticking faster. A cycle, no less, with no ends, no beginning, nowhere to come from and nowhere to go to. Because, where we are heading, is where we came from. We have been decelerating since inception, from emergence and the speed of light. As we collapse we maintain our energy, its purpose transferring from inertial to particulate energy. So, when we reach zero velocity, we are as energetic as we were when we first emerged at the speed of light. Once again it is stated that (c) and (z) are identical, they are attributes of the same event or location - two sides of the same coin. Einstein himself also contemplated for a while the concept of a cosmological cycle for time, but ran up against the second law of Thermodynamics. He once stated that while a contracting Universe would be unequivocally the same as his theories of Relativity, his conclusion was that such a concept would be far too complicated, and dismissed it as inappropriate. This paper takes an alternative perspective, especially in the light of a whole century of new scientific engagement on this very subject. Indeed, later dialogue within suggests that UC not only makes things simpler, it unifies many known peripheral theories and creates an altogether more understandable, less bizarre and no nonsense kind of place in which we live. At what speed are we therefore contracting today, at this very moment, on our busy way through the Universe perched precariously here on Earth? The Kalahari Effect gives us an immediate answer, as it did before and always does: Neither too fast, nor too slow, just somewhere in the middle. Ah, how nice! There could, however, be a mathematical answer to this question: Contraction by a factor of The Golden Ratio. UC also offers up a surprising alternative to that need for Dark Energy mentioned earlier: the very nature of contraction from light speed to no speed is that we must be shrinking faster with every moment. It would be perceived as an accelerating phenomenon. So observing the Universe from our shrinking platform would give rise to measurements of an accelerating expansion of the cosmos. It is fair to suggest that we must need another dimension of time above the one we are discussing, in order for us to express the 'speed' of contraction. Speed is determined by distance and time, so if contraction is our time dimension and it has direction, then logically we must conclude that it can only be measured to have speed if another time is applied. However, contraction is not a speed in any particular direction, so cannot have a velocity. To measure velocity one needs to factor in vectors in all dimensions of space. But contraction is simply the displacement of three dimensions, in a fourth. It is being described in this paper as having speed for clarity when actually it does not go anywhere in a cosmic sense. Indeed, as a four dimensional fractal, existence would make no progress - perception is the only progress. Motion is the interpretation of apparent consecutive events by conscious life forms such as ourselves, in a three dimensional universe. Tomorrow we are a bit smaller and our clocks are ticking a bit faster than yesterday. Let's turn everything on its head for just a second. It is entirely possible that we may be contracting at the speed of light. Just for fun, imagine this: we are sitting in a room lit by a light bulb hanging from the ceiling. One three hundred thousandths of a second earlier that light bulb was the size of the room and, we too were much bigger and further away. Now, in the present, we have shrunk rapidly and come face to face with the aftermath of that light bulb's aura. Did photons travel to us or we to the light bulb? ... And on reflection, it has been presented here that: Velocity is the counter-balance of our material collapse. In the next section, Part 6. Travel, we investigate the two ultimate ends of velocity, zero and the speed of light, and conclude that they are one and the same; that the beginning and the end of time are also connected and, therefore, redundant.